My jaw may have betrayed my calm, cool exterior when it fell open as I walked up to get Annelise after school today and saw her sporting these doozies. All she needs is a chain around her neck to hold those glasses, a lavender cardigan with appliqued cats, and sensible shoes. And a cracked vinyl, snap-top handbag filled with crinkled Kleenex, cough drops and Life Savers. Perhaps we shall call her Vera. Or Bernice? 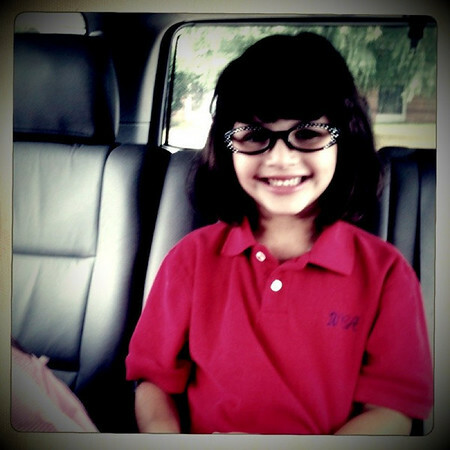 As we walked toward the car, one of her hands clutching my hand and the homework bag in the other, she announced that she now felt exactly like a first grader. Alas, she never clarified that statement because she breezed right into a detailed description of what her homework bag contained and how she was so excited to bring it home for the first time and what she was supposed to do and where her teacher bought those sparkly glasses and what she was going to do right when we got home. In other words a fairly typical day around here. After reading The Looking Book together she adjusted those sparkly looking glasses and headed out to look for five things (she's supposed to have ten, but plans to do five more tomorrow in order to stretch out the adventure). 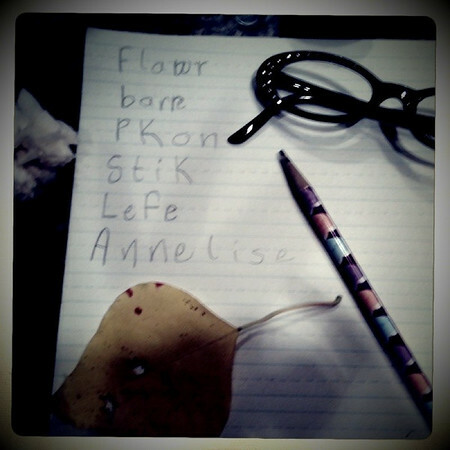 She soon brought in her items and started writing her list. The instructions specifically stated she had to spell her words herself and to sound out the words as best she could. I'm curious to find out if y'all can figure out what she saw through her sparkly looking glasses. Here's the fun part, I'm making this into a mini giveaway. This is the part when you get really excited and maybe fall out of your Laz-Y-Boy. Just leave a comment with your best guesses of what Annelise saw and I'll draw a random winner Friday night. (Don't worry, you don't need to be correct, the fun is in the guesses). Hmm? What's that you say? Oh, yeah, the lucky winner will receive a Starbucks gift card because I am desperate for fall and a pumpkin spice latte. And how did she score those cool glasses? Pecan...I'm totally using that spelling next time on my grocery list! What a fabulous teacher! Sparkly glasses! WOW! How funny, kid spelling always makes me laugh. Clearly I didn't look at the other comments first, because I didn't get bark from that! So fun! I love first grade spelling! Obviously, everyone else already them, so I'll just say... She looks smashing! She's so cute in her sparkly glasses. I love kid writing. love kid writing!! glad her homework is so fun! So cute! I won't guess since I looked at everyone else's answers but let me say that I am so glad it's pumpkin spice time at Starbizzle-- I need to get me a nice decaf soy pumpkin spice latte!